I like that Roll20 makes it's stats public on a quarterly basis. There really is a small mountain of date for those that want to drill through such. The most interesting thing to note from the latest update, from my perspective at least (and I guess the folks behind Roll20, as they made a specific mention of it in the email) is that Dungeons & Dragons 5e is the most played RPG on Roll20. Doesn't matter whether you use the yardstick of games played or players self identifying- 5e is number 1 in each case. The percentage of players identifying with a certain system is actually greater than 100%, as they may identify with more than one system in the time the data was captured. I'm just impressed at the number of virtual games going on. May have to try out Roll20 sometime to see how all of that works if I can find the time. What makes me scratch my head is the number of games:players ratios. 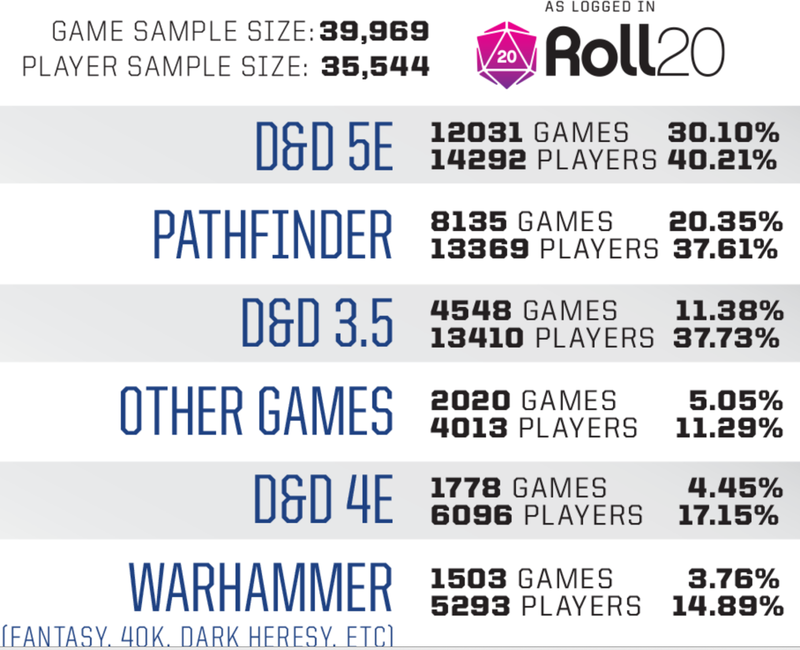 I mean I get AD&D'a numbers (around 5 players per game) but the top few games look like either almost everyone is a GM, or there are lots of people in solo games. 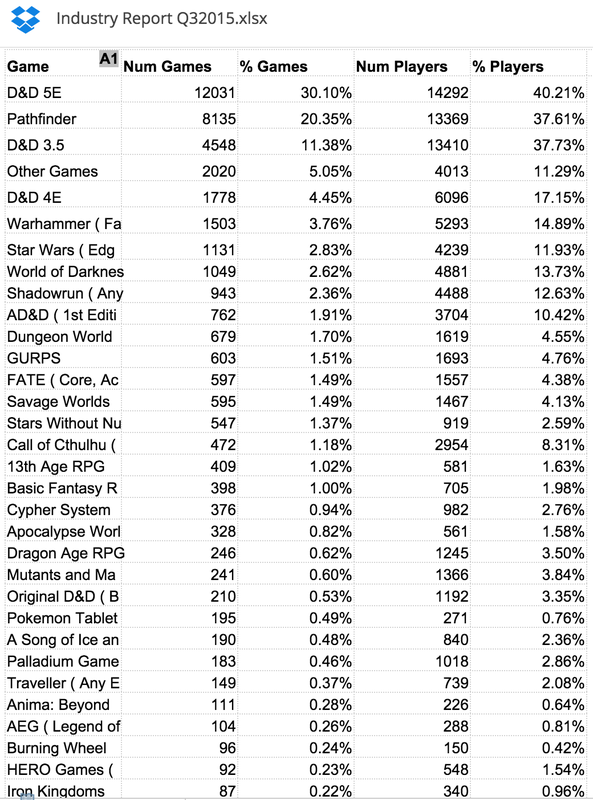 The player numbers are from account profiles where people list the games they "enjoy playing"
So someone might list D&D 5e on their profile and be playing or running no games or a dozen. They also might have every game listed on their profile or none. Interesting. 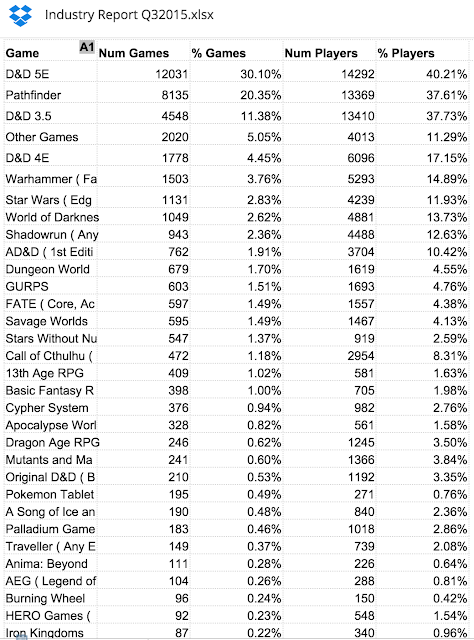 The % of people playing 3.x derived games is higher than % playing 5E.